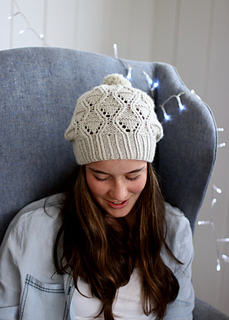 Featuring all over lace and texture, Hemera is quick and positively addictive to knit. 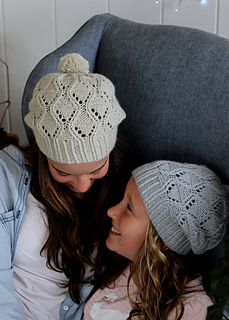 The winding stitches are quick to master and the oversized lace intuitive to follow. 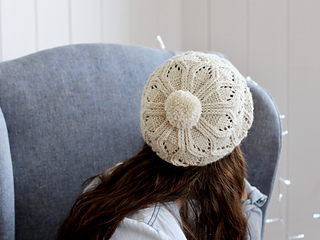 Add a fluffy pom pom for a splash of cute or enjoy the stunning crown detail without. 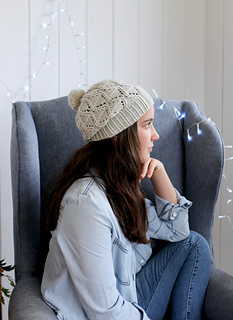 Knitted from the bottom up and in the round, Hemera is perfect for experienced knitters and beginners looking for a challenge. 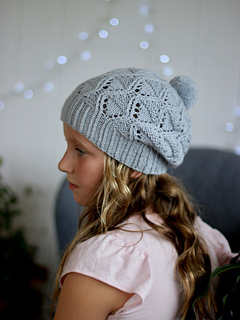 The pattern includes written and charted instructions, plus links to tutorials that make knitting new stitches a breeze. 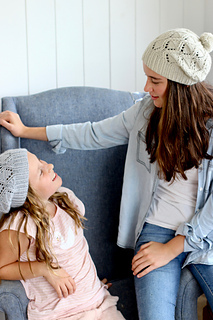 To fit head sizes Small 19 - 20 Medium 21 - 22, Large 23 - 24”/48 - 51 53.5 - 56, 58.5 - 61 cm. FINISHED MEASUREMENTS Brim circumference 15 17, 19”/38 43, 48 cm, blocked and unstretched. Length from base of brim to top centre of crown 91/2”/23.5cm. Approx. 115 142, 159yd/105 130, 170m of Nyx by Outlaw Yarn (DK; 70% Polwarth, 30% silk; 100g = 219yd/200m). A pom pom will require additional yarn. Samples shown are both size “Medium” in “Parchment” and “Fog”. You’ll need approx. 115 142, 159yd/105 130, 170m of DK-weight yarn plus extra for a pom pom.